It’s one thing to read about raging wildfires in California and quite another to experience the possibility of such a catastrophe. In early August, our secondary home in Idyllwild, a small town nestled in the San Jacinto mountains, was imperiled by the Cranston fire, just one of the many wildfires burning throughout the state. Natural disasters caused $337 billion in damage in 2017, the second highest total on record. Across the United States, wildfires burned more than 9.8 million acres last year, causing $18 billion in damages—triple the annual wildfire season record. Climate change is a factor in higher precipitation events, such as the 60 inches of rain that engulfed the greater Houston area during Hurricane Harvey. The blaze was started by an arsonist, and all 3,000 residents of Idyllwild were evacuated. For five nail-biting days, we waited, fearing mostly for our neighbors’ primary homes and their pets left stranded when the roads to the town were closed. A friend in the California Highway Patrol snapped a picture of a giant plume of smoke from our front fence line. It was a half-mile away. Winds blew westerly, not a good sign. And then our prayers were answered. The ground and aerial firefighters who arrived by the hundreds to battle the blaze finally got it under control. Although the fire consumed more than 13,000 acres, the town and all but a half-dozen homes were spared. Other municipalities throughout California have not been so fortunate. The largest wildfire in state history burned for more than a month and encompassed more than 400,000 acres. 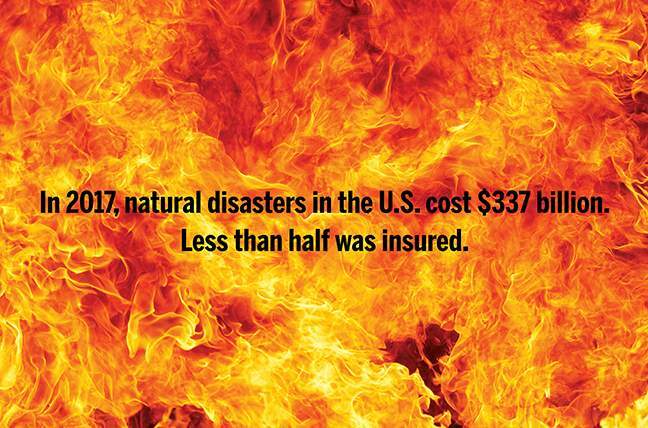 The costs of such natural disasters are borne by all of us—in our taxes and our insurance premiums. That cost was made clear in 2017. A study by the Swiss Re Institute found the economic damage caused by natural disasters last year totaled $337 billion, the second highest on record—of which $144 billion was insured, the highest on record. Three hurricanes that year—Harvey, Irma and Maria—ranked among the five worst hurricanes in history, in terms of financial costs. Insured losses from all wildfires in the world totaled $14 billion in 2017, the highest ever in a single year. In the United States alone, more than 9.8 million acres burned in 2017, costing $18 billion—triple the annual wildfire season record. Among these wildfires was the Thomas fire, California’s worst fire in history at the time in terms of acreage burned. For businesses, natural disasters represent a serious risk management issue. Many surveys of large and midsize companies rank natural catastrophes among their top three risks. For small companies, such disasters are an even greater threat. In the years ahead, diverse structures in regions vulnerable to natural disasters are bound to experience substantial property damage and destruction. Large companies will endure significant supply-chain disruptions, delays in business operations and reduced revenues. Many smaller businesses will fail. What is being done to prepare for this dystopian possibility? The paradoxical answer is: quite a bit but not enough. For example, in ZIP codes designated by the Federal Emergency Management Agency as susceptible to natural catastrophes, 40% of small companies experienced natural-disaster related losses that curtailed business operations. Only 17% of them had business interruption insurance, according to a 2017 study by the Federal Reserve. Leaving aside potential causes, more than 97% of climate scientists in peer-reviewed studies in notable scientific journals concur that the planet is warming. And more than 80% of climate scientists in studies conducted by groups supported by the oil and gas industry affirm that climate change is happening. “The evidence is unequivocal that the planet is warming, with literally thousands of studies using all sorts of evidence to draw what are pretty rock-solid conclusions,” says Richard Black, director of the Energy and Climate Intelligence Unit, a U.K.-based nonprofit that publishes on energy and climate change issues. What does this mean for natural disasters? It depends. Among the scientific community, some potential effects are generally agreed upon, while others have less consensus. As the planet warms, ocean levels rise for two reasons: thermal expansion (water expands as it warms) and the flowing of melting land-based ice like glaciers into seas. “We can measure sea levels year by year and have seen gradual increases that may accelerate in the future,” said Robert Muir-Wood, chief research officer at catastrophe risk modeling firm RMS. When hurricanes form, they create an additional abnormal rise in sea level—called a storm surge. The greater the rise in sea levels, the higher the risk of extreme flooding along coastal areas, given the expanded volume of water. “There’s no doubt that hurricanes will inflict heavier damage due to rising sea levels caused by climate change,” says Michael Oppenheimer, a climate scientist and professor of geosciences at Princeton University. “That’s a no-brainer. The flooding will be greater and will extend more inland from coastlines.” That said, 90% of Harvey’s insured property losses derived from inland flooding and not hurricane wind intensity. Muir-Wood shares this opinion. “There’s pretty good evidence to suggest we will have more intense rainfall resulting in extreme flooding events like we saw with Harvey,” he says. Another factor in hurricane flooding is duration of the storm. Hurricane Harvey lasted 16 days—from August 17 through September 2. According to the journal Nature, climate change affects what scientists call “translation speed”—the speed at which a hurricane travels forward. This speed is slowing, indicating that storms may linger longer in a particular geographic area, increasing the risk of flooding. The changing climate might also explain why scientists expect more Category 4 (130 mph to 156 mph winds) and Category 5 (157 mph or higher) hurricanes. That’s because hotter oceans provide more energy, fueling wind intensity. If there is a silver lining in these dark clouds it is this: more frequent hurricanes generally are not anticipated, with some climate experts predicting a potential decrease in the overall number of future hurricanes, based on models involving warming temperatures. According to the National Oceanic and Atmospheric Administration’s Geophysical Fluid Dynamics Laboratory, three or four small hurricanes might merge into a single large hurricane, although the organization acknowledges uncertainty on this subject. Prior to the 1970s, wildfires in the United States received little attention from the government and the public, as they were generally smaller and sporadic and occurred in mountain regions with scant habitation. Then all hell broke loose. According to the Union of Concerned Scientists, between 1986 and 2003, wildfires burned more than six times the land area, occurred nearly four times as often and lasted almost five times as long as wildfires reported between 1970 and 1986. More recent statistics indicate that wildfire seasons were 84 days longer on average from 2003 to 2012 than they were from 1973 to 1982. Large wildfires also are taking more time to contain, burning an average of more than 50 days between 2003 and 2012, compared to six days between 1973 and 1982. He’s referring to the fact that our world has seen weather like this before. Ancient Egypt was lost to one of history’s most withering droughts, and the United States’ most protracted drought occurred during the Dust Bowl years from the 1930s to the 1950s. However, we do know that the increase in air temperatures due to climate change does cause drier conditions, such as decreased soil moisture and increased evaporation of water from lakes, rivers and other bodies of water—all of which can exacerbate drought conditions. There is no single set of people other than the actuaries at insurers and reinsurers who are better at understanding these risks and calculating their frequency and severity. While climate change can be blamed in part for the recent scourge of natural disasters, human folly contributes to much of the economic impact. First, too many people (myself included) continue to live in coastal areas and mountain towns, regardless of the known dangers. Second, those of us living in these regions downplay the risks and do little to reduce their impact. “Despite all we have learned about the impact of hurricanes, wildfires and other natural disasters and how to protect ourselves and our businesses from their impact, we’ve actually done very little to reduce the material losses from these events,” says Howard Kunreuther, a professor of decision sciences and public policy and co-director of the Center for Risk Management and Decision Processes at the University of Pennsylvania’s Wharton School. He attributes this reaction to myopia, amnesia, optimism and inertia, which combine to make us always expect the best, even when bad things are blatantly obvious. “People have a tendency to think when they move to coastal areas in a hurricane-prone region that the worst won’t happen to them, despite all evidence to the contrary,” Kunreuther says. Muir-Wood expressed a similar sentiment. “In most cases, the risks of a hurricane or wildfire are greater than how people perceive them,” he says. By doing little if anything to reduce the potential impact of a natural disaster, when the next one arrives the aggregate damage losses are higher than they otherwise could have been. A study by insurer FM Global affirms this connection. The multinational property insurer/property loss prevention specialist company evaluated its losses from Hurricanes Irma and Maria, comparing the data of clients that had taken loss prevention actions based on its recommendations with those that hadn’t taken these actions. This is good news, indicating that losses can be contained. Such losses run a gamut wider than just property damage to homes and buildings. “There are arrows that go from climate change to things like food security, geopolitical stability and economic growth, all of which create risk management implications for companies,” Kunreuther says. In fact, according to one study, as much as 95% of fresh produce is perceived to be at risk because of climate change. Livestock health is also at risk, as warming temperatures cause heat stress and increased demands for water that may not be as readily accessible. Fortunately, there are many smart ideas circulating on how homeowners and businesses can reduce their risks of property damage, including water runoff systems like dikes to contain flooding, spraying homes with fire retardant prior to a wildfire and hurricane-resistant doors and windows. For more information, check out FEMA’s online hurricane preparedness and wildlife planning toolkits. Fewer people die worldwide from hurricanes and wildfires than in the past. But on the property and business interruption side of things, the record stinks. Michael Oppenheimer, professor of geosciences, Princeton University. Part of the problem is the National Flood Insurance Program, which is deeply in debt and nearly insolvent, in part due to repetitive claims for property damage by the same homeowners. “NFIP is in need of reforms,” Dove says. Congress is now studying common-sense reforms to NFIP, like improved flood mapping and the identification of properties filing repetitive damage claims. But even with such enhancements, unless flood insurance is mandatory in vulnerable regions, not everyone will buy the insurance. Kunreuther proposed the idea of offering all homeowners and businesses financial incentives, like lower premiums and affordable loans, for structural improvements they undertake to reduce storm-related damage risks. It’s not just a government problem, though, and there is a lot the private insurance market and other businesses can do to help encourage mitigation. And the private insurance market is growing for flood. Several reinsurers like Swiss Re are partnering with primary carriers to offer the coverage. Altogether, carriers wrote more than $623 million in business in 2017, a 51.2% increase in premiums over the previous year. Nevertheless, this is a pittance compared to the NFIP’s $3.5 billion in 2017 premiums. Insurance brokers also can help tip the scales. “Too many policyholders are confused about what is and isn’t covered when a natural disaster strikes and are surprised when something they thought was covered wasn’t,” says atmospheric scientist Marla Schwartz, from reinsurer Swiss Re. An unambiguous “voice” may well be needed. Every time the United States suffers a shocking disaster like Hurricane Katrina, Superstorm Sandy or the California wildfires, the inevitable hue and cry that follows eventually subsides—until the next big disaster arrives. “The challenge in the future will not be lack of risk-bearing capital to absorb catastrophic losses,” Muir-Wood says, “but whether insurers are allowed to charge for the underlying cost of risk based on their technical arguments.” If they can’t charge for the actual cost of risk, he says, insurers might need to pull back coverage or pull out of markets entirely. “Certainly, the world is not helped by a U.S. administration that doesn’t accept climate change as a reality, making the chances of support for infrastructure and building adaptions at the federal level currently nonexistent,” Black says. Banham is a Pulitzer Prize-nominated financial journalist and author. russ@russbanham.com.